This is a very simple circuit which will drive either of two relays via one wire. Apply supply voltage to the control wire and one relay operates. Apply zero volts to the wire and the other relay operates. R1 and R2 bias the transistor bases to half the supply voltage. When the control wire is connected to 0v Tr1 turns on an operates RL1. When connected to Vcc, Tr2 turns on and operates RL2. Of course only one or other relay can be operated. 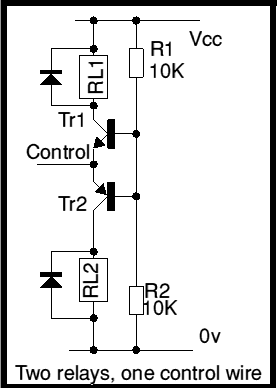 This circuit cannot operate both relays simultaneously. This is the circuit used in 4QD's Horn Relay Board. The standard build uses one such circuit but the board allows for two such circuits.